Someone wants Christmas to hurry up. Someone needs to hurry up because Christmas is coming. Whoever you are, worries about making a Christmas present might have been in your head more than once. The situation becomes even scarier when people realize that the whole family (or even family members from both sides), co-workers, business partners are in the list of those waiting for your gesture. Potentially, it could be a reason for the invention of postcards, agree? The postcard is a good choice for all those trying to find the answer to the question: "How to congratulate everyone." But through it all, with the invention of the Internet and cell-phones, postcards have to fight to survive in the modern era. That is why people today are looking for alternatives. But as we know, there is nothing new under the sun. Handmade postcards have a very long history. It's the warmest and the kindest way to congratulate everyone you want. Through history, people invented numerous ways to make a postcard. Today you can easily find detailed instructions on how to make a handmade postcard. However, we collected the best ideas for Christmas handmade postcards in this article. Hope it will be helpful. This method becomes a good solution for all those who want to make a trendy postcard in 5 minutes. Don't panic about fingerprints. If you do, there are some methods for conspiracy theorists as well. We will talk about them later. Use scissors to cut a piece of recycled cardstock. We will use it as a base of our postcard, so make it as carefully as it is possible. Wet your fingers with water and blatantly dip them into the light brown coloring. Actually, you can use any color you like, just be careful with color-scheme. Leave your fingerprints on paper in a random way. Remember: each spot you leave is a face of a deer. If you are not about making a party for them, 9 spots will be enough. We don't need more reindeers than Santa has, do we? Use red color (or any color you wish) and a brush to paint noses. Just make sure deer's noses are round-shaped, or at least they look like noses if you decided to make them heart-shaped or whatever. Use black coloring to create eyes and horning. Two dots are enough to paint eyes. You can also play with lines to create worthy horning. Use your imagination! Feel free to draw some accessories. Create bow ties, glasses, and hats, whatever! Add the message and your postcard is ready! This postcard is the best way to hide your message. You can use words from your favorite books, movies, etc. You can create a poem tree, or you can just use the pictures you like. Whatever you wish, feel free to use your imagination! Now let us see how to make a bookworm postcard. Use scissors to cut a base for our postcard from the recycled cardstock. 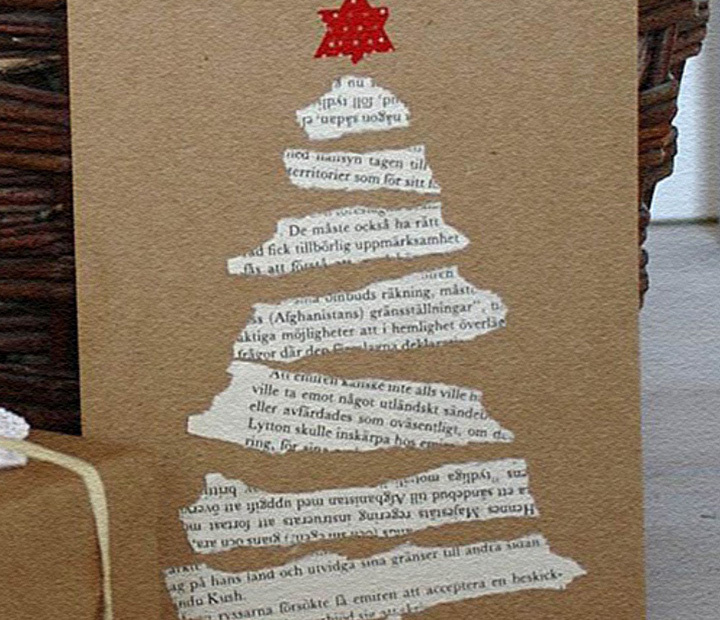 Wrap printed pages to make a tree. To create a tree as it is showed on the picture, we have to make seven rectangles and one triangle. Make sure the parts of paper you wrapped are looking like a tree when placed together. You can use scissors to create these figures as well. Do as you wish! Use glue to stick our figures down to the base created before. Take scissors one more time. We need to cut a star from our splash-papers. Make it red or yellow. You can also make them using gold or silver paper and your tree will shine like a real Christmas tree. Stick your star down to the top of your tree. Your postcard is ready! If you want your tree to look even better, you can cut round pieces of splash-paper to create Christmas balls. If you want to try something new, something a little bit weird, here is a potato-stamped postcard. It looks fantastic, right? It will take around 10 minutes to make it, so let us start! As usual, we have to make a base for our future postcard, so take the scissors, recycled cardstock and carefully cut a rectangle. Cut your potato in half and let it dry a little bit. You can use the towel to remove moisture as well. Apply white coloring to the pattern and stamp it right to the middle of your postcard base. Take a paintbrush, turn your imagination on and create your Christmas creature. Don't be afraid of combining different features. This postcard is about to look like a fairy tale. Congratulations! Your postcard is ready! Have a nice Holidays and Merry Christmas!